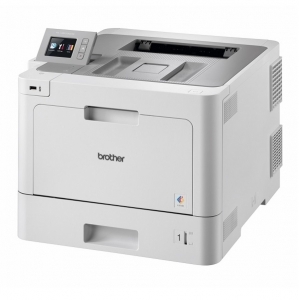 Purchase this Brother printer and receive free delivery & installation by a Brother Technical Service Provider. Some conditions do apply. Perfect for the small to medium business with ambition, Brother’s HLL9310CDW is the reliable and fast printer you can count on. This high-performance printer helps to increase your productivity with print speeds up to 31ppm. With high quality colour laser prints, the HLL9310CDW features USB, wireless and wired connectivity, a 6.8cm touchscreen, a 300-sheet paper input, as well as NFC connectivity that allows you to print by touching your phone to your printer. This printer takes the standard black TN446BK, cyan TN446C, magenta TN446M, and yellow TN446Y toner cartridges; as well as the high yield black TN449BK, cyan TN449C, magenta TN449M, and yellow TN449Y toners.